Posted on February 1, 2007 by Alicia Bay Laurel	in Blog. On Saturday, January 27th, 2007. 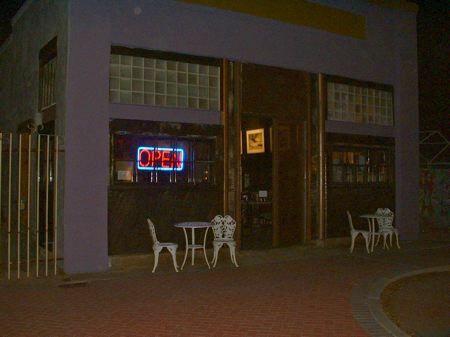 I played two hours of my music at the Paisley Violin, a supremely hip small eatery on Grand Avenue in the downtown arts district of Phoenix, functioning as a second living room for the boho denizens of the neighborhood. Musician Chris Warmuth, who lent me a PA system which he gallantly carried from house to car to club to car to house for me, ran into half a dozen friends while we were there. My new friend Sarah Curtis came to this show, too, to sell stuff from my table while I was playing. 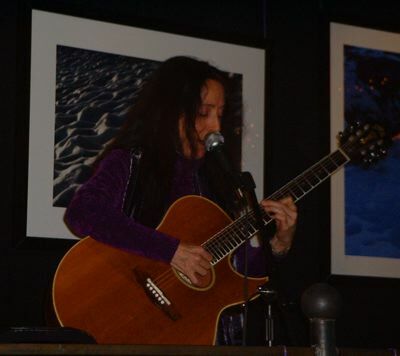 This being a CD release party for my most recent recording, I played and sang ten jazz, blues and gospel songs and two jazz standards from What Living’s All About, accompanied by a version of the final mix from the CD that excluded my recorded vocal and guitar parts. Well, all but one song. Nature Boy was recorded rubato (outside of a time signature), improvised in the studio by me, upright bassist John B. Williams, and percussionist Enzo Tedesco, all of us playing at the same time. In order to perform the song with the recording minus my voice, I would have had to memorize the entire improvisation and duplicate exactly what I sang on the recording. That kind of misses the whole point of doing an improvisation, which is to spontaneously create music together that has never existed before. So, Nature Boy was relegated to being played (as a finished recording) during one of my breaks. 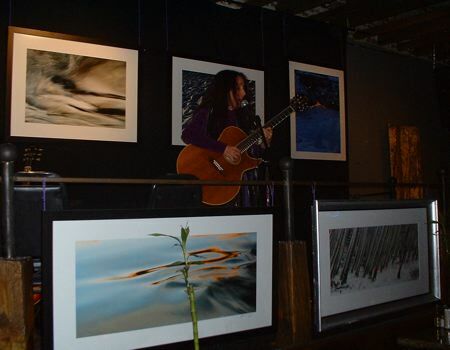 I played on an elevated stage surrounded by wonderful nature photographs by Greg Lansing, whose show lasted the month of January. After my second set, Chris, Sarah and I had a delicious meal at the bar. Check out their fabulous menu. 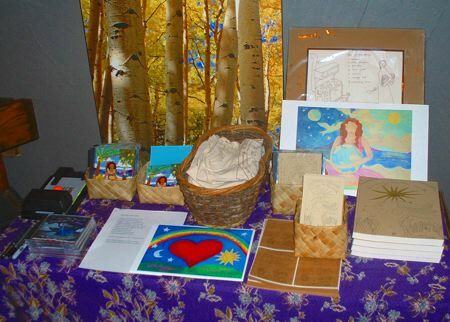 I brought a full panoply of my wares, and Gina, the manager at the Paisley Violin, offered to keep the table set up and sell the goods on it during the week to help publicize my second show at the Paisley, next Friday, February 2nd, from 7 to 8 PM on the evening of the First Friday monthly open gallery art walk.